Consumer versions of Skype 7 and 8 will be silently removed from all workstations commencing 26th September 2018. Recently we’ve identified and confirmed that a malicious advert within Skype has infected a workstation with an extremely intrusive piece of malware. As a result the decision has been taken to urgently remove this from all workstations. We’ve been looking for a way to continue managing Skype in an enterprise environment for some time with no satisfactory solution. Skype 7 has been end of life for a while now, though Microsoft have previously continued to develop it with ad-hoc version updates despite saying it was longer being maintained. Skype 8 also presents us with issues around managing updates, with no controls to restrict it from attempting to auto-update and then often leaving the application in a state where it is unable to run when the update failed. 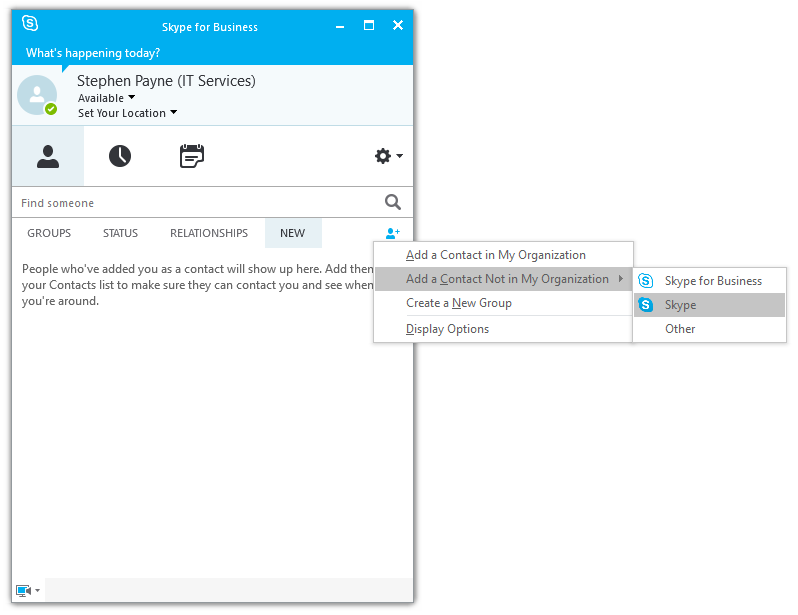 Skype for Business is available on all CONNECT workstations via the Oxford Application Installer menu (http://help.it.ox.ac.uk/connect/apps-installer). This can be used with your Nexus 365 account, further details are available at http://help.it.ox.ac.uk/nexus365/skype-for-business. How do I contact non-business accounts? 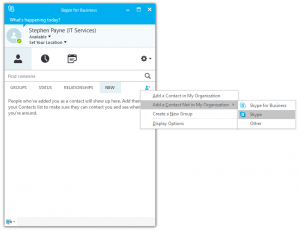 Skype for Business will now allow you to call and message both Skype for Business and Skype accounts, allowing you to add them to your contacts lists. To do this click on the ‘add a contact’ button ( see right) and then through ‘Add a Contact Not in My Organisation’ click on ‘Skype’. Once they have been added you will be able to call and message them in the normal way. What if I want to use my personal Skype account? Personal accounts can be accessed through the web interface, https://web.skype.com.